I once read there are three stages to most every trip that give you the opportunity to make your trip ‘bigger’ than just the trip itself….1. being excited about planning the trip & anticipating what you’re going to experience; 2. the actual trip itself; & 3. looking back on the memories you made during the trip. I know it’s not everyones mindset for their trips, but I love this! So, for the past week, I’ve been enjoying the process of list making, packing, cleaning, organizing, double checking & most everything involved in getting ready for a trip. This is also the time of year that I take my Mother in law to her semi annual medical appointments. Since I knew I’d be here to get all that taken care of, I scheduled my own annual check ups with the eye doctor, dentist & my yearly physical. Grateful…oh so very grateful, everything has come out normal. The first thing I did one Saturday night while Danny was at the lake, was pour myself a great beer & re-format & revise my oh-so-detailed rather over the top 5 page packing list. It’s filled with way more stuff than I would take on one trip though, but it’s everything. The list is divided into several sections: stuff I have to take on all trips; then a section for flying; for road trips (including pre trip check list for the 4Runner); for camping; for backpacking; clothes for each season; for biking; for kayaking; for running (I’m no longer running, but why trash a perfectly good list…maybe I’ll take it up again); for Colorado; for Florida; for Sisters on the Fly Events; a food list & one for everything I need to charge before I leave. I started this list about 10 years ago & have fine tuned it with each trip. When I’m about ready to start packing, I duplicate the list on the computer, then title the list with the trip name, then begin to delete items I won’t need for that particular trip. I’m stoked right now because I have two lists going…one for my upcoming trip to Florida for 10 days to see Claire & Emma; the other for a super long road trip beginning the third week of April. Yay! Yay! & Yay!!!!! I finished the ‘dehydration’ project. 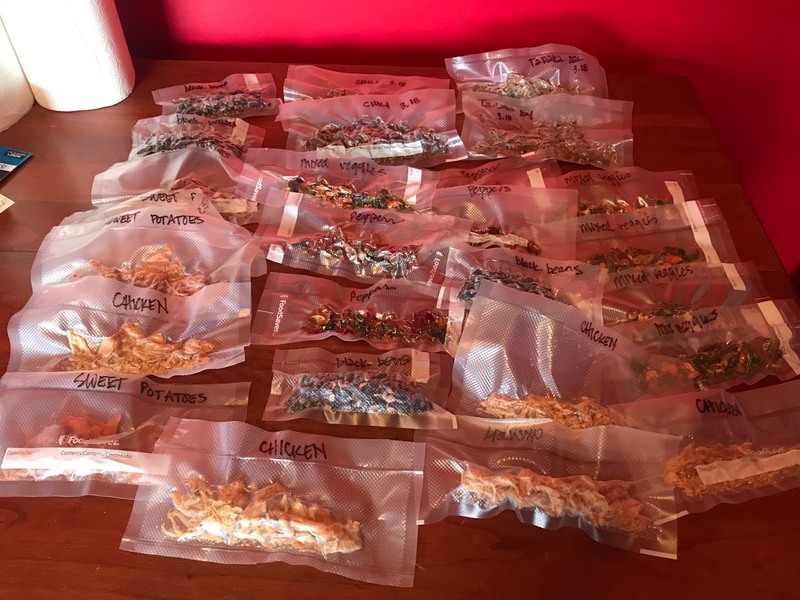 I don’t know how many meals or partial meals I ended up with, but it’s a gallon ziplock bag filled with dried vacuum sealed food. My last attempt was sweet potatoes & black beans. I’ve had to read & research more about rehydrating…not as quick as I thought it was going to be, but I’m going to give it a try. The last two projects I tackled were using a product called Reflectix…which is an insulating sort of silver bubble wrap. It’s used to insulate some things in houses & a lot of car campers cut inserts for their windows for privacy but mostly to retain heat. They also use it to make a ‘cozy’ for their cooler or cook mug….this is why I bought it & what I made. 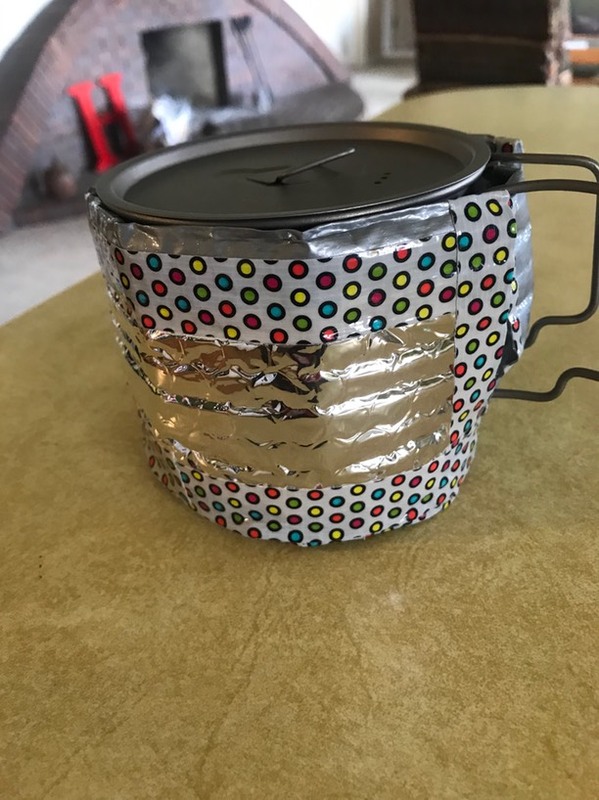 I’m not crazy about the annoying silver spaceship look of it, so I bought paisley patterned duck tape for the seams for the cooler & polka dot for the cook cup. We’ll see if it was worth the small investment—both money & time— to save some ice & keep my rehydrating meals hot. 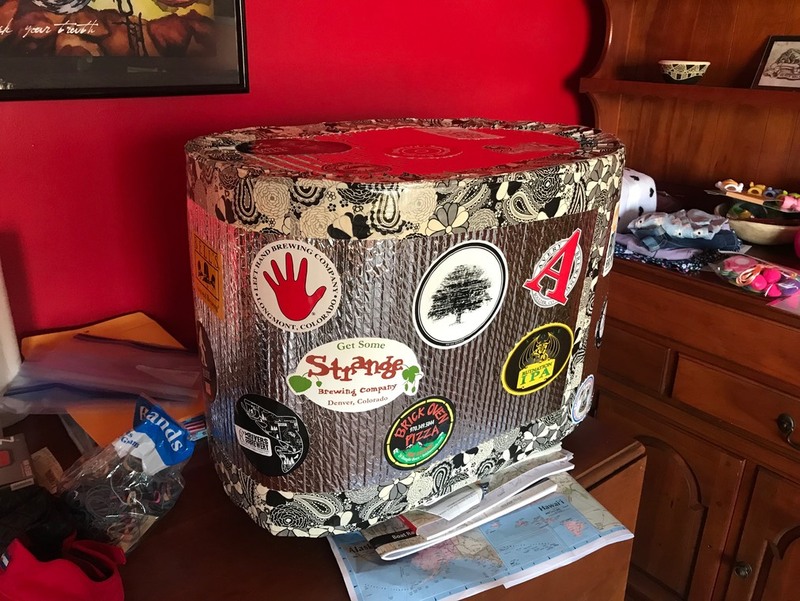 I just couldn’t stand the plain-ness of it all…so I dove into my sticker collection & added my favorite touch to the cooler! This year I have the Thule topper as my new addition. I was able to put it on my old 4Runner, by myself (shortness doesn’t help when trying to attach this large box to the top of your SUV) & proceeded to drive around with it…empty…but trying to see if it felt any different. It didn’t. But, I have almost popped into an underground garage once, am taking note of all the places I can not park, & buzzed under the library drop box without considering the overhang until I was on my way out…then gasped but so grateful it was high enough to accommodate my 7.5’. Oh brother…this shouldn’t be a big deal to remember while I’m a shortie, my 4Runner + Thule, is not. 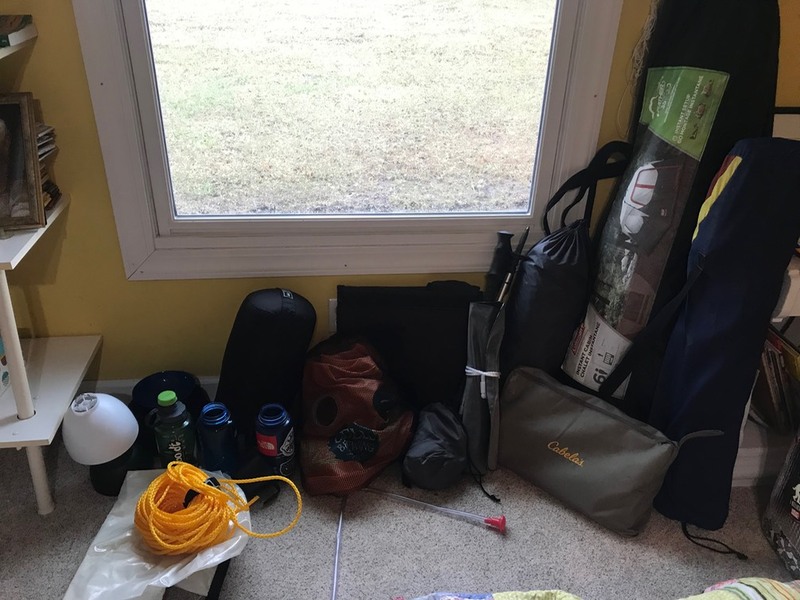 Then I started gathering all my gear in my bedroom…Yikes it always looks like way to much! I will save packing my clothes until I get back from Florida. 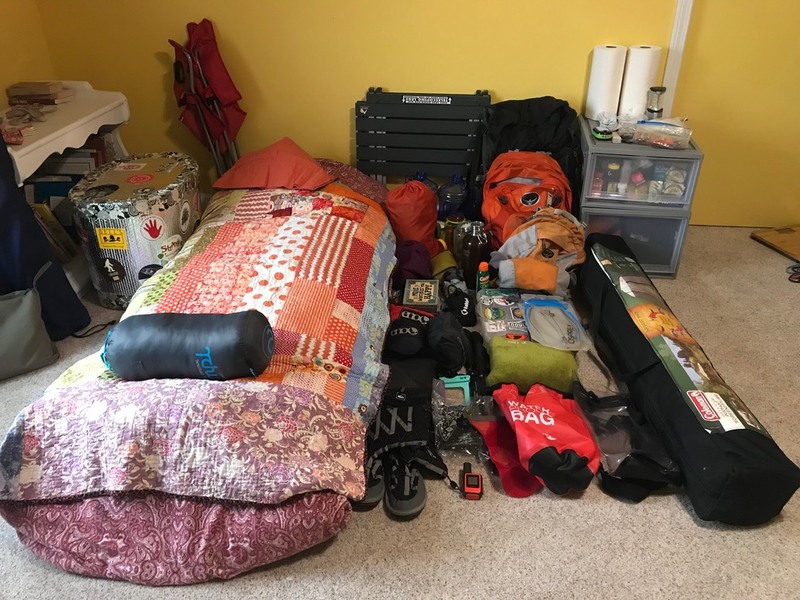 So I began by separating my gear from what goes in the Thule (Danny’s camping gear, the tents, my emergency bag, an inner tube, my big backpack, & stuff I won’t need very often) & what goes in the back of the 4Runner. Today I cleaned the carpet & upholstery & all the surfaces in Camper with hopes to start loading it this Tuesday. The trip itself is still not totally planned, but I’ve got time at the end of this week to go over maps & research my route. It always changes anyway, but here’s my trip planning process: I make a note for each state I’m planning to visit & list the places I want to try to see—hikes, breweries, landmarks, National Parks, restaurants, people——everything gets put on this list. Bolded if its a must do. Then I put the list in order of south to north or east to west or in some crazy loop….whatever direction I’m headed so I come to the first thing on the list…then I can delete it once I go there or if I change my mind or whatever. At least I won’t miss it by not having it on the list. The state lists also make it easy for me to add new things as I’m traveling…so many times other travelers will suggest things that are not even on my radar…I love that! Saturday will find me quickly packing a bag for Florida & all the fun stuff I’m taking to the girls & Sunday I board a flight to warm, sunny & green Florida. I can’t wait to hug those precious girls!! Excited that Danny will be joining me the following weekend for 4 days!!! Once back I have 5 days to pack my clothes, get my haircut, a couple of other appointments to take care of, & do a pre check of Camper, then I’ll be road ready & so excited to be traveling again! !